At the beginning of 2009 as at the end of 2008 I wrote letters to those involved in my case. I wrote to the head of the Healthcare Departments and areas involved each with what I would say a brief statement of the facts mainly for my records just as much as for them. This was just to let each know what I have been doing all these years, to reiterate the facts. To show I am campaigning and will continue to do so until it is all exposed. I wrote in the same way to some of the well known organisations who have totally failed me. The letter below I have sent it many times. I sent it and a cover letter saying how dissatisfied I was with not just the Government but the Opposition to (at the time David Cameron and Nick Clegg). After the third letters to Nick Clegg and David Cameron (which included the newest letter to Gordon Brown) someone representing Nick Clegg finally replied. OK it was a standard letter in these situations you receive, but it was a reply and it did talk of the issues involved in a general way. I acknowledged receipt of this letter and gave a final reply for now. This was to say if Nick Clegg would like to meet so I can show him the seven hundred plus pages of documents to verify what I have been saying just contact me. And until then I would campaign on my own. As for David Cameron I was very disappointed after the third time I did get a response. A blank postcard. This was not good enough. So I wrote back to him resending the letters. I then got a reply from the Conservative party itself. Which included a cover letter that did not speak of any of the issues involved at all. And a long winded speech that he’d made somewhere recently again not even generally talking about any of the issues involved, that I wrote to him about. I finally wrote back expressing my dissatisfaction. And that I had given him plenty of chances to respond properly. And I have left it at that for now. Best now to read the letter below before I add more. Also copied to David Cameron and Nick Clegg with their own individual cover letter. Two miss spelling's have been corrected here, since it was sent. The fact that you choose to get people to write on your behalf which is and will be used to exonerate you from that correspondence. Does not exonerate you. You choose what they do on your behalf. You are responsible for their deeds and actions which you have them do on your behalf. I wrote to you about the affects of child abuse. You failed to respond yourself. Recently you stated and asked how a child dies when the system fails an abuse victim. Yet you do not listen or respond when me and people like me at the time or later tell you, your system, your government, about it. Which is one of the things I touched on in my first correspondence. I am disgusted that you and others insult our intelligence as to not knowing how the system fails abuse victims. As because of what I stated earlier. And the fact that for many many years children have died because of abuse, or suffered it. A fact. Including recent cases that became high profile. You, your government, previous governments are guilty. You all can not obviously be blamed for the start of abuse. But all of your and their systems failings to act on the facts known in cases directly leads to more abuse being suffered and deaths. This is a fact. Once facts are known but not acted upon. I say this because it’s a fact. And because you, your government and previous governments have eroded any chance us vulnerable people have of people within the system being held totally accountable in general (not including one off specific high profile removals caused by public opinion and not the write or wrongs of the situations of which I would like to add would lead to it happening a lot sooner). This is true in many ways we find and have to fight against being consumed by it all whether we fight it or not. Safeguards which have always been lacking in social services (a proven fact) but by more so in sections of the health care profession such as GP’s and the mental health services. When they fail in the first instance we are abused, die, re traumatised, directly, indirectly. This happens under your government as had under previous governments. (but lets concentrate in all of this on you and your governments responsibilities and guilt in a non political way please). Not only have you failed to secure our basic fundamental human rights. But you and your government have undermined and eroded them. In many ways one being:- insuring that when people within the system do wrong we have very little if no recourse of action to take. You, your government have made it nearly impossible for us to have our rights of duty of care to be enforced. In cases like mine there have been no safeguards for me only the safeguards for those who are guilty safeguards for the health care professionals who are responsible that insures that they are protecting at all costs (does the name shipman ring a bell? it will happen again have no doubt I know as they do what they want and still get away with it) but not only does this total protection at all costs happen when they are innocent ( perfectly understandably) but more so when they are guilty. Even when they and other health care professionals know something is wrong. In many of our cases including mine after these failings and more within the system (and yes outside its jurisdiction) we have little or in most cases no recourse of action. Because you, your government and others have eroded the system when it comes to what used to be called legal aid. Many solicitors don’t do public funded work. Some that do will not have a franchise for action against the health service in clinical negligence cases. Some won’t deal with cases where it involves people with mental health problems or issues. This erosion leads to and serves only the status quo. The guilty. It allows abuse, neglect within the system to continue. It leads especially and significantly to doctors having total impunity to do in most cases anything they like. Unchallenged by any one. Except us and they know it. They are in such cases a law unto them selves answerable in reality only to them selves or only on their terms a protection which again protects them only at all costs. Fact. And the law even protects their unlawful acts because you, your government creates the situation where in reality we are denied full access to protection with it or from it. In my case some examples of their acts (health care professionals):- they have been allowed to confer with each other (getting their stories straight) to protect themselves and their actions. They have insinuated things on my medical records. They have put miss leading things on my medical records. They have lied on my medical records. They have broken the data protection act. Belittled child abuse and its serious consequences. They put and have all the above on my medical records for years and still do. Despite the real situations that are very different than what they have stated. A whisper campaign that only makes the above worse as time goes by and only ever added to. They miss diagnosed me and continue to lie about it (including in writing) they have re traumatised me, neglected me. The consequences are no different than any other abuse I have suffered (which is all types). They have been negligent. It all came close to killing me as it has done for years since. I will have to live with it for the rest of my life (what they have done) to cause the unnecessary pain, suffering, and trauma that has damaged me even more. Some who face this are no longer with us because of it. People who abused me or where abusive where compassionately dealt with. I had the opposite for years they said I did not need their help. That I was not even mentally ill. Which they now on record lie about and say they knew I was ill and that they helped me. Other specialists from other areas were well aware of not going against what other health care professionals have said. Even when they knew it was not true. Making sure I did not receive the help I needed. Even for years making sure I did not get an independent second opinion I wanted and needed. Even after fighting for years to get one I still knew it was never going to directly disagree with the others of which you can clearly see on my medical records. I tried for years with those at the time directly and indirectly to resolve and get this all put right but was only treated the same or even worse. I tried the CAB for help who in these instances sadly failed me. I tried help from other organisations I tried complaining at the time and later as now. I tried ICAS. The health Care Commission of which they on two occasions failed me and only seemed interested in preserving the status quo. I tried locally with GP’s. with NHS chief executives. Only for more lies, assertions and more neglect to be dished out. I tried and am trying the legal route. Being failed by it as I have said earlier in this letter. Why must your system be aloud to lie, abuse, neglect and discriminate against us? This is not an attack … it’s a fact. Why must our rights be second always if we have them at all? … a fact not an opinion. I and others continuously bring these situations to you, your government and others. Yet the situation is the same or even worse. You, your government and others clearly do not care. You act as other governments do… not in the public interest but when… it is in the public domain and becomes a high profile case. Doctors and other health care professionals must not continue to have near if not total impunity. This is a fact. My case and others prove it beyond all doubt. I hold you personally responsible. If I did not then I would be saying your not fit for office. I hold your government personally responsible as I hold previous governments responsible too. As I said to a representative of the Scottish Government in a correspondence with them. It is not paedophiles that make the laws that we need to protect us. That is one thing they are not to blame for. That is the responsibility of Government. We have been abused. Yes. With what it all means for our existence not lives. But the system abusing and neglecting our rights, our lives is something you all should be ensuring either doesn’t happen or is safe guarded against. You have all failed. You have all actually made it worse. Do not insult our intelligence by saying “how does this happen” when its so blatantly obvious and well known. I have spent over a decade trying to get it put right to have their neglect stopped I have failed but I continue as always to try. And I will continue until I die. I assure you prime minister this is not the last you and others have heard from me. I will never stop until they (within the system health care professionals e.t.c.) are in a court of law and become for the first time answerable for their actions and in actions and or if all else fails I intend to totally expose them and all those who have and do fail me and others including you, your government and other members of the opposition. And the organisations that have failed me all these years to help support me to stop it all continuously continuing. I will not stop until you, your government, the opposition and others work together to put in place a proper system of checks and make them ALL FULLY RESPONSIBLE AND FULLY ACCOUNTABLE for their (health care professionals e.t.c.) actions and inactions. I do not except these correspondents being passed onto other departments prime minister. If other departments do respond I will ignore their response now. And just resend this to you again. It is my right. Look at this poem I wrote found on this website:- http://www.napac.org and another. This poem is not caused by depression or any mental illness. It is an account of my life of abuse. An account based on the truth. Not to be analysed as anything other than that. I have the scars and broken bones to prove it. Health care professionals in my case belittled child abuse. And the day they did that and others supported, ignored or turned a blind eye to it. On that day there was never any going back for me. And never will be. I can never undo any of the abuse I can never do anything to make it worth it. But I always endeavour to make it not all for nothing. In my existence it is all I have left. In this letter I have described the system as yours or theirs. The day it protects us and treats us how we should be treated. When that happens we will ALL call it ours. So I have sent this letter a few times now. I sent Documents and several from my medical records to show what I have been saying about those Healthcare Professionals and organisations involved is true. I sent some to Her Majesty The Queen and three other members of the royal family. 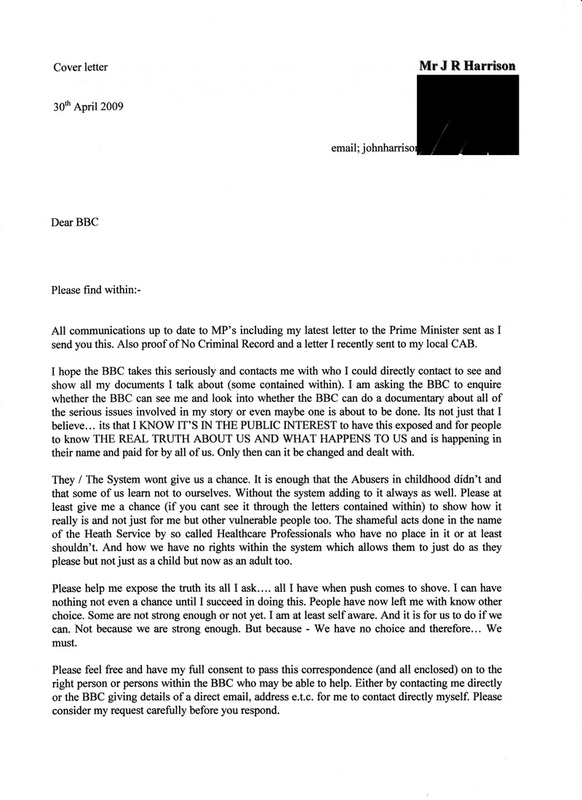 I have also sent the same letters to a person within the media, to see if I get a response. Why do this? What do I expect to achieve? Again to show I have left no stone unturned I have done all I can. If I cannot do it myself, if I cannot get others to act, then what is left? To do all you can to make as many people / organisations aware of it as possible. But what if they do nothing? That is the point as far as I am concerned. And if you do all I have done and am doing you can prove and show this. And what they do or not do in the first instance is not in my / your control. Its hard to take but at one point or another you have to realise this and deal with it as best you can. 17th March 2009 read a letter I received. Hurt. But to be expected. 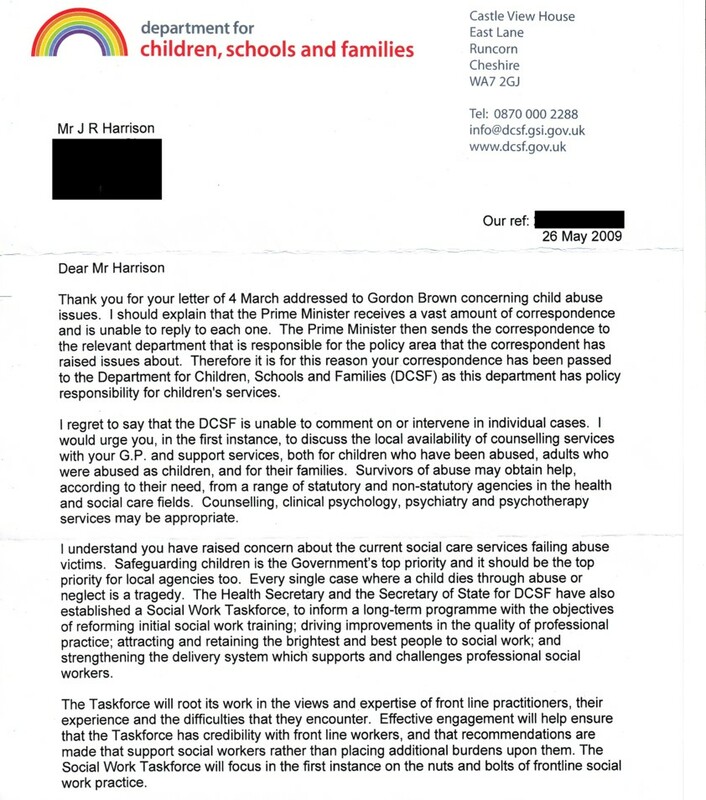 The Department for Children, Schools and Family has responded again on behalf of the Prime Minister (Gordon Brown). This is a reply to the second time I sent the latest PM letter (above). Sent 31st January 2009. Stating how the Prime Minister receives a lot of letters so it is passed on to other relevant Departments. And that they can not comment or intervene on individual cases. And that’s good enough? So I'll go away and suffer in silence then? NO. I'm not sorry. I wont. This is how they are, but get this. On YOUR or MY behalf. We will be heard... the third time onwards I sent this letter I also sent a few copies of letters proving what I say. This was from March 2009 onwards. So they are catching up I await a specific response to that before I go further. B well. 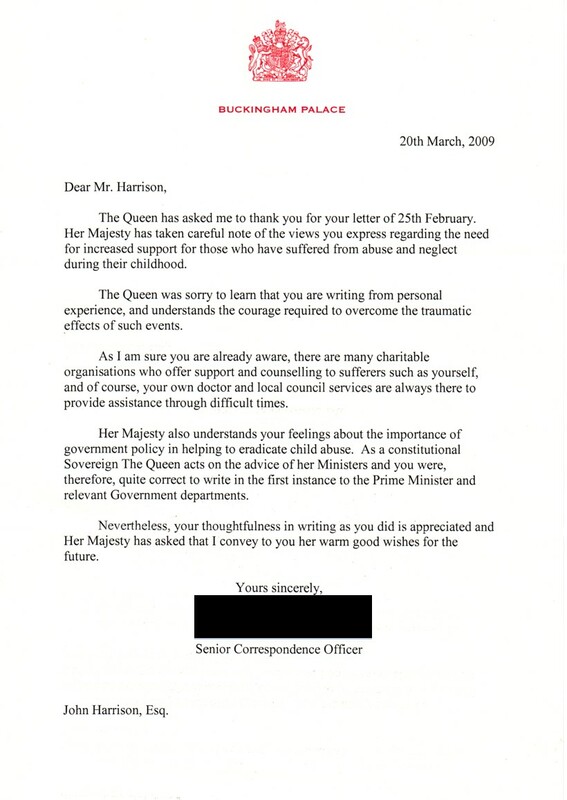 On 20th March 2009 I received responses from two of the members of the royal family that I had written to, see below. One was from Her Majesty The Queens representatives. In the correspondents to The Queen and others I gave all up to date Letters that were to and from the Prime Minister (Gordon Brown), other MPs or their representatives. I also included proof that I have No Criminal Record and an email that I had sent to the Law Society (among others) outlining my serious concerns and the organisations that have failed me and us so far. The representative of the Queen acknowledged receipt of my letter and said that The Queen must rely on her ministers to act on her behalf. Sadly The Queen along with us are being let down (of which I had re-laid in my letter to them). I acknowledge that obviously The Queen nor any other member of the royal family is going to be involved personally. But as I wrote to them as I am a British Subject and all I can do is make all involved and those in power know and be aware of myself and others. That I have done. And at the right moment let all see what I have done, been trying to do and to see that I could have done no more. And hold my head up high knowing that... IT IS THE SYSTEMS FAILINGS AND THEIRS NOT MINE OR OURS. 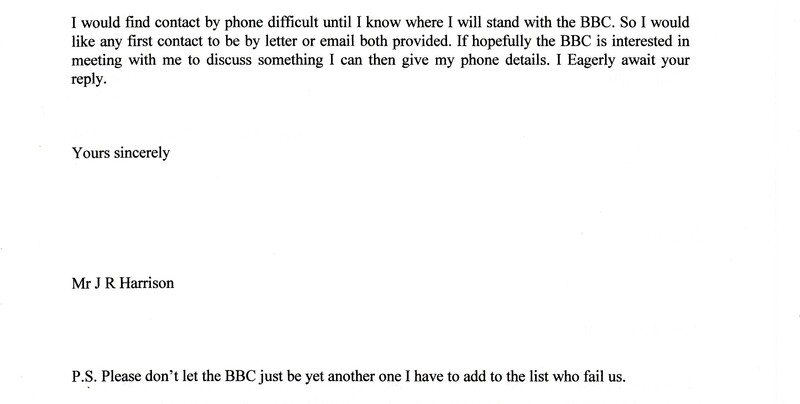 On the 1st of July, I rang THE BBC because after sending a letter (found above dated 30th April 2009) with all that it had enclosed I had heard nothing. After about a month I sent a postcard about this. I heard nothing back to even say they had received my letter. And as it had been two months I rang and told them this. They acknowledged receipt of my letter 5th May 2009, I explained how I felt. That considering the issues and all involved I thought I might at least have received an acknowledgment of them receiving my letter. But they said they could not do this. So I was none the wiser whether they wouldever get back to me about it. I have to say I don’t think this is right. I am Disappointed in the way these things are handled. 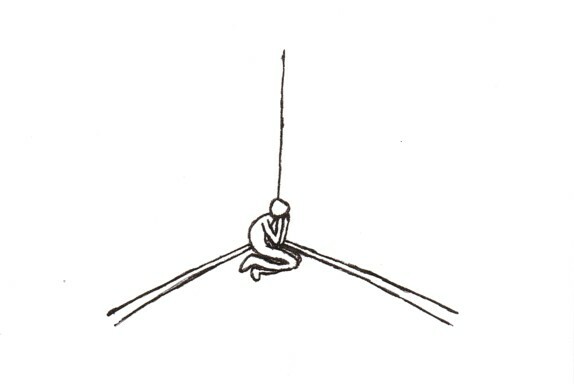 Some of us take a lot of time, money and effort or deal with a lot of pain, trauma and stigma just to stick our head above the parapet. I would always hope that these institutions could have a better policy to deal with these things. Anyway we will see you never know maybe they will contact me before I do something else. An enquiry would be nice. 21st September. I gave the BBC the chance to at least reply. But the BBC like others within the media are part of the problem themselves. Like all of it, all you can do is go through the procedures, like going through the motions. I did what I could. 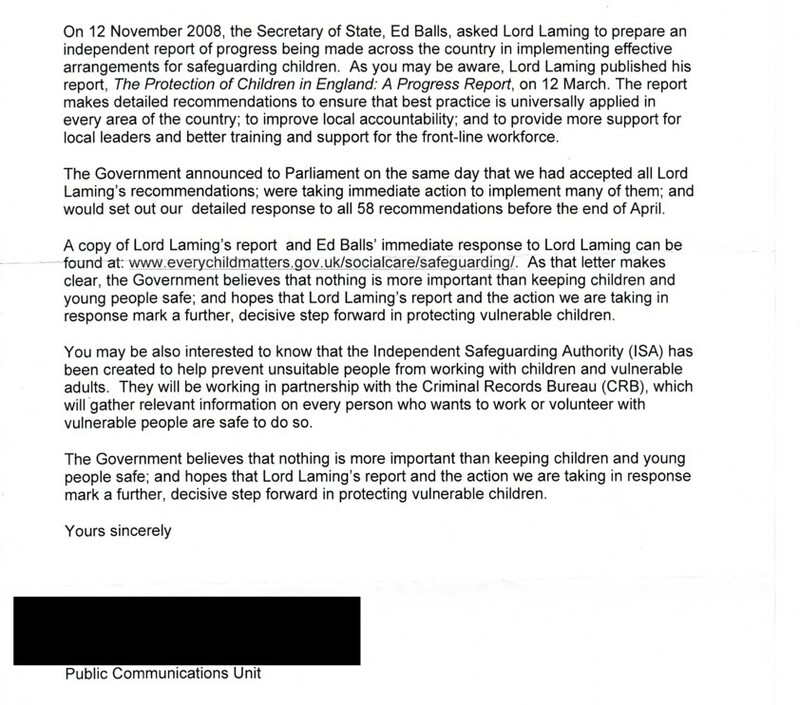 On 4th June 2009 received the letter below from The department of Children, Schools and Families again (third response from them) on behalf of Gordon Brown (PM). ANGRY, HURT, BEWILDERED. At the time I wrote this: Pent up inside ready to unravel any progress in keeping it together. There?s little you can do to prepare yourself for this. I feel like directly emailing the person. But I must not. I can not control it. I have to contain it now it is all I can try and do. UPSET. ITS TOO MUCH. They win... I cant take that it drives me insane. It messes with my head. It disturbs me deeply. I?ve been here so many times so why do I do it to myself? Because I have no choice. I want, We need change to come. And with them be assured it will never truly be any different. It is up to us and each other. When you receive their so called responses. It's so clear THEY SIMPLY HAVE NO SHAME. I have now given it some extra time to upload this. I will write again to him and I will not stop. They will have to stop me. And if that were to happen then I will document it and expose it. After I received that letter and read it I wasn?t feeling well. Been here so many times before. But it never gets any easier no matter how many times you go through it. They don?t listen, they don?t act and we suffer. I had already stated to them that I will not respond no more only to the PM. In the letter below it says again they can not act on individual cases. How far would that go? To what existent would they continue with that attitude? That policy? When criminal acts are being done? Abuse? Neglect? Their argument is nonsensical if you think about it. What do you think they would say and do, if you a member of the public knew of a crime, abuse or neglect being suffered by someone but you did not act or report it properly? What do you think they would say and do about you? What would the Police do? Do you not think they would say it was your duty especially if they were vulnerable? Why are they aloud to act as if they are not bound by the same morals we are? The same responsibilities as an individual let alone as part of the system why? It / they are cleary part of the problem. The last two times I sent the letter I sent with it proof of some of the things I say in official documents I have. Has the person even read the letter? It goes on and asks me to go to all the very people that years ago I tried to, that then failed me. Clearly I am being ignored or they fob me off or they have not read the letter properly. There sadly are more reasons for this type of response but you can see that yourselves. Think about what?s in the main PM letter. When they tell me to go to the very people who fail me, us and it is one of the very reasons I have had to right to the PM, MPs and the Government in the first place. And the letter clearly states that. When the Health service fails you. You try and sort it out and it continues. You complain it continues. You make several official complaints with several independent agencies. But it still continues. The law refuses to protect you. You take it to all the people agencies you can. It still continues. No one will help. No one will protect you. All the things I say in the letters that have been done. Which I no need to repeat. After all that you go through and take, you take it to Politicians most don?t even respond. Then they tell you in real terms they will do nothing. And then they put the onus back on you a vulnerable person. I think therein lies a fundamental problem. The system says its not for us to do and so I will be neglected, abused have no rights. And that?s the way it is. Because their neat little boxes say there is no other way. Though they are not looking for another one. Just preaching their way. Like they are a computer program that knows no different unless it is reprogrammed. I say there is. They must change and we must get more and more to see how there is no net in the first place. And now as far as their concerned for themselves that?s it. NO! IT'S NOT. On the 19th June 2009 I received a letter from The Department of Health for the first time (see extract below). They said (despite the direct information given on Health Care Professionals) that they have sent the letter onto The Department for Children, Schools and Family. I awaited the PM's response as before, and as beofre it didnt come. I waited because: it is he who I wrote to. I resent the letter again containing proof of some of what I mentioned to him as I had previously done. Too busy? People in power will have to make themselves un-busy then wont they? because this is serious and some of us (myself included) will continue to campaign directly to him (The PM) and others through the media and so on until then. And until accountability is made a reality. If I close my eyes it doesn't make me blind. If that happens that I do not see is a choice. And I cannot say I am Blind to it Mr Prime Minister. But don't worry because when you open your eyes we will still be here. Telling the same truth sadly. Mmm... Run around, Merry Go Round, Hide and Seek. The above letter seems more like a game than Life, Reality and a Government. Sorry to seem sarcastic but I don’t remember the DCSF being my adviser, to advise. I'm writing to the Prime Minister. No one else. I did not, I do not ask anything of them. Nor have I ever. I only replied to them once (not initiated by me) originally to thank an Individual for their letter. I am writing to the Prime Minister it is my right and if he doesn’t respond (for any reason) then that’s a choice. Someone’s not mine. One that is duly noted. And as to what The Government Departments have wrote to me. I am glad I did not waste my time or theirs in contacting them originally. Maybe they should have got the Prime Minister to respond? Maybe they should if my letters are forwarded to them, take it up with those who forwarded it to them? if they had a problem with this. I am writing to the Prime Minister. I feel a writing coming on. If it does come out it will be called "I am writing to the Prime minister." Now there’s a story and a half. DONT YOU THINK? A few hours later I did write something I called it "To Who? and Why?" On the 23rd July 2009 I received reply from 10 Downing Street via The Direct Communications Unit again. Same old, same old. Extract from the letter here "I can assure you that a careful note has been made of your concerns, and your previous letter was passed to the relevant Government Department" Mmm... careful note. Is that... Documented Abuse? My previous letter was passed to the relevant... thew, for a minute there I thought it was going to say The Prime Minister now that would have been relevant, as in the right person for a start. Have I stated it is to whom I write? The beginning of the reply as before you know... he's a very busy man. And how he would just love to write to me and everyone. You mean, deal with real people and real consequences? Are you sure? Does anyone remember that incident when Tony Blair was the Prime Minister and he went to a Hospital and a real unscripted person spoke to him? Mmm, I don’t remember him being all that pleased far from it. Surprised, awkward yes but pleased? no. Very few are lets be fair. It’s not as easy to dismiss the real truth with facts and figures via equations, mathematics and nice glossy charts, when someone’s looking you right in the eye with a truth contained within them. And more to the point others are going to see your reactions. All of the above is what being Prime Minister entails. What we are doing this is not a Job to us, this is not just another campaign to some of us. This is real lives, our real lives, someone else’s. Something we want something done about Prime Minister. And you (who evers PM now), they can Document it all they like, the Government Departments can, other Organisations can. As they have, as I have told you all. We the victims / survivors, we the ones who see the other victims, we who hear of each other, we know all about Documented Abuse. Yes it’s when all the above Document it but don’t act open it. Mmm Isn’t that what a lot of us keep hearing? How its Documented? It has been duly noted? When will it change? When we don’t take no for an answer. When we don’t accept it. When we don’t let those in authority rest for a moment without being made to realise that we are still here and we ain’t going anywhere. When we stand together until it changes, they change and until they and others realise that... we will never change, we have nothing else. So I will be continuing on and on until it starts to change for real. Years have past since I first wrote this. On the TV people hearing of things going wrong in the NHS, mistreatment, failings, vulnerable people suffering. Hello! Im still saying it, and still people have not acted upon it. For everyone they do listen, it is outweighed by those that arent listened too. ITT WILL NOT CHANGE until we are all listened to. I believe in our NHS, though I have to stay away from it. We have to take iot back from them, that will harm or allow harm to be done or covered up. As promised I again resend you this correspondence for a FULL and PROPER response from YOU. And I will continue to do so until that happens and until a proper Investigation is done. So that all those involved are brought to account. Made Accountable, Punished or Dismissed whatever the Facts shows need to be done. And for changes to be put in place so we are protected and this is enforced, enforceable and a willingness to do so is brought about. I DO NOT WANT ANY REPLY FROM ANYONE ELSE BUT YOU PRIME MINISTER. I have to say that again. Also please be aware of the five replies I have received from Government Departments on YOUR behalf (enclosed). I respond to you below briefly about it. The first reply I received from The Department for Children, Schools and Families (DCSF) I sent a reply thanking THAT INDIVIDUAL for their response. The second DCSF reply I received was dismissive of responsibility at the very least. The third DCSF reply was dismissive of responsibility (again) and clearly shows what we are up against. Noting that clearly they either haven’t read the letter or are just plain ignoring the PAIN STAKING FACTS literally involved in my case that I bring to you all. The fact that the DCSF suggests that I go back to GP’s, Healthcare Bodies and other organizations for help and support. When they are the very bodies I am writing to you about beggars belief. And it is an affront to my suffering and an utmost disrespect to people in my situation. Be aware Prime Minister it is YOU and YOUR GOVERNMENT and DEPARTMENTS that need to listen to US. Not only do you all clearly not know what is really going on (said with hope…) But you are unwilling to hear the truth to do what YOU all are here and paid for to do. And about the very things that makes your job so important, and when failures to do so has such disastrous effects on us which I have told you about. 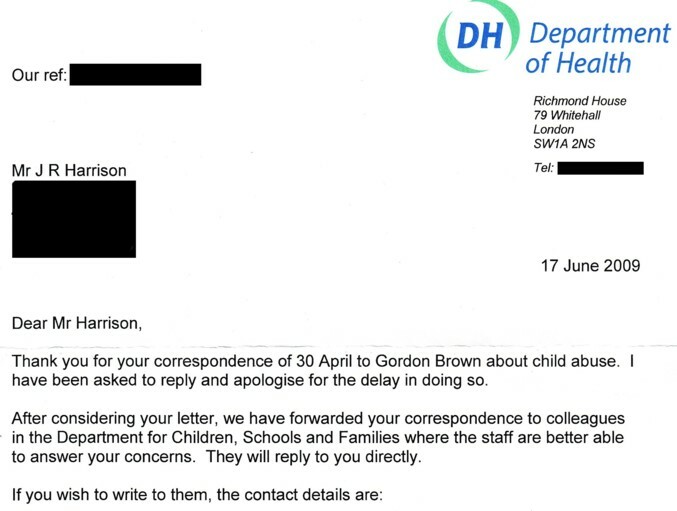 The fourth response was from The Department of Health and I quote from it “After considering your letter, we have forwarded your correspondence to colleagues in the Department for Children, Schools and Families where the staff are better able to answer your concerns.” Now though I know this is partly true with regards to some issues involved. You can’t help but wonder how this lye’s with the fact that contained in your letter is direct information about Healthcare Professionals in my case. That is something that is The Department of Health’s concerns… or should I say… should be Prime Minister. The Fifth Response as above plus a slight attitude. The DCSF should take out their frustration on No 10’s Direct Communications Unit, and not me and my Legal right… to be heard. The 18th December 2008, The 31st January 2009, 4th March 2009, 30th April 2009 and 4th July 2009. 1) Main letter. Also originally sent to David Cameron (Conservative) and Nick Clegg (Liberal Democrat). 2) First letter I sent to you 1st April 2008 entitled PM. I wrote this when Tony Blair was still Prime Minister but I was not able to complete and send it. But as it was still as relevant when you became Prime Minister as now I sent it to you. It was also copied to David Cameron of The Conservatives, Nick Clegg of The Liberal Democrats, Alex Salmond of The SNP, Ieuan Win Jones of Plaid Cymru, Ian Paisley of The Democrat Unionist Party, Sylvia Harmon of The Ulster Unionist Party and Gerry Adams of Sinn Fein. Below added in correspondences from 4th March 2009 onwards. 3) Sixteen Pages from My Medical Records and Book I created included self explanatory. I am not just making this all up or not all there. Maybe now you will see what I am saying some you can see for yourself. 4) email sent to The Law Society among others sent before and since. I AM NO LONGER WAITING TO HEAR FROM ANY LEGAL REPRESENTATIVE NOW. Before that is used by someone as yet again an excuse to not respond Shamefully. Below added in correspondences from 4th July 2009 onwards. 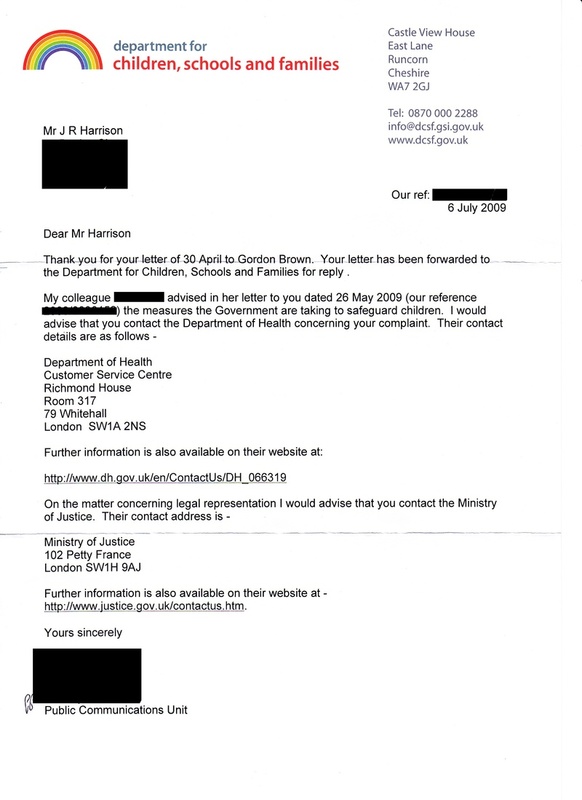 6) Four replies from The Department for Children, Schools and Families and a reply from The Department of Health. Note:- When I tell you about the Abuse, Neglect I have suffered and are suffering. Your Government say’s it’s been noted and do nothing else. In so doing YOU are condoning “what they have done”, “are doing” and “will do”. I will not allow this to continue unopposed. The last decade and more clearly shows this kind of attitude and I will expose it in a very simple way for all to see. As I have said to you before I have copied all this information of the seven Hundred documents plus that I have in case something happens to me. In any event. And others have seen and are seeing these documents that I talk of. All information contained in letters to you and others are Provable Undeniable Facts (a brief sample I have enclosed to show this). I will not be Ignored, Silent or Silenced. My voice. Our voice will drowned out the silence and denials. I have also written to Her Majesty The Queen and three other members of the royal family. Two responses I have received. I have since my last correspondence 30th April 2009 written to The BBC I await a response from them to see if they will help me expose this. I have spoken on the phone to a BBC representative about this. The BBC have received all correspondences I have sent and received from all Politicians, Proof of NO CRIMINAL RECOLD and a letter I sent to the CAB. As I had already done to someone else in the Media and the Four members of The Royal Family that I contacted. I am also while waiting to see if The BBC will help expose this. Thinking of my other options to do this with either other broadcasters or through other forms of media. Since the last correspondence (4th July 2009) I have successfully used other forms of media to Highlight my case and expose the failings in my case for people to respond let alone act. All of which in due course you and others will be made fully aware of. We are continually failed by all those I spoke of in my email to The Law Society. And no matter how crazy it sounds it is all facts. We have nowhere to go. Nowhere to turn to. We are and have come to the top. And we are not going anywhere until this is done. We’ve been there, done it and got the T Shirt to no avail. This must be exposed and this must change. My existence as others is ready to be used to this end. So that others are not continuously failed by you and others always. I have nothing else to be here for. As I have said before. I cannot take it all away. I cannot change it. But I do everything I can to make sure that it’s not all for nothing. Ignore me, use excuses all you want. BUT YOU WILL FACE THE TRUTH, OUR TRUTH AND THE PART YOU ALL PLAY IN IT. BY YOUR CHOICE NOT OURS. The real situation of how it really is for us will be signed like a signature with my existence as others. Ready for the many when they are strong enough to sign it with theirs too. DO NOT CONTINUE TO CONDONE WHAT HAS BEEN DONE, IS BEING DONE AND WILL BE DONE (because of failures to act). Either way I will expose this for all to see. We fight for True Accountability for one and all. Brought about by the loud silence that echoes this great country with great shame. I had to begin to be more fully open and public. I wish it could have not been the only option left to me. But they had made it so not me. I tried all I could. But the message I and others need to be told and known to the general public is too important for all of us and we must not now let one person or a few get in the way of this message this exposure of the truth. I am actively as you can see looking into the best way I can do this always. Is my story unique? sadly NO. Has it been told before? sadly YES. Then why bother? Because the fact that my situation and others is the way it is, shows there’s still much wrong and its the only way. The status quo still seems to serve one and all except us. Accept the vulnerable and innocent. Its built up for their Denial. The Abusers, the Ignorant, the Guilty. The "oh it was a long time ago" and the many many more... WE WILL NOT ALLOW THIS TO CONTINUE UNCHALLENGED. On another note if the Abusers - Neglecters want forgiveness or ever care about what they have done. Then it is just as much for them as it is us. For I believe only after the truth is admitted can any of this happen. Only after this can any of us even start to begin to be set free from this burden of shame we carry. And without this how can you expect forgiveness if you don’t admit the crime you have done? I am not telling you I can personally forgive. I like many don’t except this at this time it is all too much. Especially since I still suffer at their hands and the system hasn’t along with them stopped hurting me. And never let anyone tell you you must forgive. It is a personal journey for you alone to decide. And from me if you can forgive then I support you. I only do this not for the abuser but the victim / survivor if it helps them. If it didn’t I wouldn’t even mention it. But if like me you do not. And don’t want to understand how you could. I know how you feel. And never let anyone make you feel guilty because you cant or you wont forgive. We must stop carrying guilt that they wont carry or accept, that is truly theirs not ours. If you want to see some of the pages sent to the PM as proof? They can be found on the Documents page.